There are 7,641 islands in the Philippines how do you decide which ones to visit? We asked 30 travel experts what their favorite place in the Phillippines was and made this list of the best tourist spots in the Philippines. No matter where you go you in the Philippines won’t be disappointed. We’ve broken the list into the 3 island groups that make up the Philippine archipelago: Luzon, Visayas, and Mindanao. Dividing 7,000+ islands into three groups is a very rough sorting, it will serve as a starting point to help understand the tourist areas of the Philippines. The Luzon islands include Luzon itself, Palawan, Mindoro, Marinduque, Masbate, Romblon, Catanduanes, Batanes, and Polilio, and surrounding smaller islands. Luzon island is the largest island in the Philippines, it’s 40,541 square miles in size. You’ll more than likely start your Philippines trip here landing at the Manila airport. If you’re island hopping in the Philippines via plane most flights fly to Manila and then onward. There aren’t many places in the world that live up to all the hype. When we told fellow travelers we were traveling to the Philippines they all said one of the best places in the Philippines is El Nido. El Nido is the kind of place you could spend a week and never get bored. Most of your time in El Nido will be spent out exploring the islands on the day tours. We highly suggest Tour A and Tour C if you only have time for two tours. Secret Beach on El Nido Tour C we could spend the beach at all day. Crazy limestone cliffs surrounded by turquoise waters and hidden beaches are what to expect on day tours. After a day exploring the islands El Nido town has a great beach town vibe, with beach bars and happy hour specials to catch the sunset. Great selection of restaurants and hotels for every budget. El Nido is an adventure in itself getting to but it’s totally worth it. If you considering purchasing a drone this is when you’d want one. Sadly on our trip, we didn’t have ours yet, it’s the perfect place to bust out the DJI Mavic and don’t forget bring a Mavic ND filter. Coron is a great place to visit in the Palawan and one we’d recommend at least 3 nights unless you’re diving then you’ll need more time. Coron should be on all divers Philippines bucket list. Many of the dive sites you’ll need to be advanced open water certified and if you’re not yet it’s the great place to get certified. You’ll get the certification and see some amazing stuff too. If you’ve ever seen a picture of Coron it’s more than likely from Kayangan Lake, which is visited on day trips from Coron Town. Like other islands in the Philippines day trips to the surrounding islands will keep you busy during the day and at night you’ll head back to “town.” Coron Town itself isn’t much of a party town, most tourists are exhausted after a day in the sun so call it an early night. We highly suggest making sure you stay at a hotel with a generator as power outages in Coron happen all the time sometimes lasting all night. We stayed at the Corto del Mar hotel which was great and they had really good food too. Note: If you’re traveling to Coron by plane pick an earlier flight with Cebu Pacific. We had the afternoon flight and it got canceled after a delay because the airport in Coron doesn’t have runway lights so all planes much land before sunset. Most tourists fly in and out of Manila and never leave the airport. When traveling to a new country it’s always good to spend a few days in the capital city and get a glimpse of the local life. We suggest going on a private Manila tour, this one is only $87 and is in a Jeepney the local way to get around in Manila. We’re not going to lie Manila can be rough and it may shock you. We went on a slum tour in Manila to Smokey Mountain that was heartbreaking to see how many people live. Here is our 2 days in Manila itinerary to help plan your time in the city. We suggest staying in Makati, which considered the cleanest, safest, and nicest area to stay in Manila. It’s the country’s financial and business hub with shopping malls and skyscrapers and the best hotel options. Traffic in Manila is bad if you plan on only spending the night then stay close to the airport. Manila’s traffic is often ranked in the top 1o worst in the world, Metro Manila has been listed as being the densest city in the world based on population density, hence the traffic. Sibuyan Island is one of the lesser-known islands in the Philippines despite its proximity to the more popular Boracay. We went to Sibuyan almost by accident after having to change our plans during Holy Week in the Philippines, when we discovered that the more popular destinations were mostly fully booked. We had heard about the remote island nicknamed the ‘Galapagos of Asia’, and the difficulty of getting there due to the few transportation options available. We figured out that this would deter many people from traveling to the island and hoped that we could have it mostly to ourselves! In fact, during the 10 days we spent there, we only saw two other foreigners! The mountain Guiting-Guiting stands tall in the midst of Sibuyan’s vast rainforest, surrounded by the island’s (only) ring road. Sibuyan’s coast is as stunning as it is rocky. There are no white sandy beaches typical of neighboring Boracay, no fancy restaurants or resorts. There are instead, spectacular waterfalls, the cleanest river in the Philippines and a wild, untamed jungle.Sibuyan quickly became our favorite destination in the Philippines due to its natural beauty which has not yet been spoilt by any form of mass tourism! We hope it stays that way! They may just be the most spectacular rice terraces in the world, and even better they still don’t see too many visitors. In the past, that’s been down to poor road access, but since I visited the road has been largely paved. Get there quick! The journey to Batad is an adventure in itself: sitting on the roof of one of the Philippines famous jeepneys, before a short downhill hike to the terraces. Nothing will prepare you for your first sight of the luminous green amphitheater. It’s a view you could stare at for hours and an amazing area for hiking. Some of the paths are pretty narrow so it’s a balancing act to keep from falling in, I had a number of close calls! The whole village feels far from the hustle and bustle of the rest of Asia. The first thing you’ll notice after the taking in the sheer beauty of the area is the silence. How often can you say that in Asia?! It’s like stepping back in time, people still work the terraces much as they did 2000 years ago. After spending a year on the continent, I can definitely say it’s one of my favorite spots. Batanes is the northernmost province of the Philippines. Its landscape is often compared to New Zealand, and the like but I must say that Batanes has a charm of its own. From NAIA, there are direct flights to Basco (the provincial capital) once a day, but what makes it harder to go here is usually the price of the airfare. Also, flights are frequently canceled during monsoon season. The Philippines is not short of superlative adventure travel or eco-travel destinations, especially ones where the landscape is breathtakingly beautiful, so to say that Albay and specifically Mount Mayon is among the best of them is no mean feat. The near-perfect cone of Mount Mayon is the centerpiece for a burgeoning adventure tourism industry in Albay. ATV rides, ziplining, kayaking, trekking and even hiking up this impressive – and still active – volcano. The mountainous terrain is an adventure lovers paradise, with the twin peaks of the neighboring mount Malinao and Masaraga giving even experienced mountaineers a challenge, and the surrounding forests offering lush eco parks for hiking and even an enchanting waterfall or two! All these activities and more are fast making Albay the adventure capital of the Philippines and I love it. But what makes me really love Mount Mayon is not the scenery or the myths and legends that surround the volcano. It is not even the activities themselves. It is the fact that many of these activities and the industries that support them from accommodation options to restaurants, are locally run, not supplanted by international branded chains. So by having an awesome time on and around the volcano, you are also supporting the local economy. When I first arrived in the Philippines, I had never heard of Sabang. It’s located on the island of Palawan, and I still didn’t know anything about the place when I got to Palawan! Going to Sabang was somewhat of an afterthought. We had booked a tour to the Puerto Princesa Underground River, which included a morning in Sabang. I didn’t even bother to check the place out on Google beforehand! When we finally got to Sabang, I was blown away. It was absolutely beautiful! The beach was long and golden and virtually unhabituated. It felt like paradise! I kicked myself for not doing some research! After a brief stop at the beach, we went up the hills surrounding the beach. From there we ziplined over the water, and down to the beach. It was an amazing way to take in the surroundings! My only regret is that I didn’t get long enough to soak in and explore the beauty on offer in Sabang. I will certainly stay for longer when I return to the Philippines! Batangas is a first class province of the Philippines and its capital is Batangas City. It is bordered by the provinces of Cavite and Laguna to the north and Quezon to the east. Batangas is one of the most popular tourist destinations near Metro Manila, the capital city of the country. The province boasts many mountains and beaches and is famous for excellent diving spots including Ligpo Island in Bauan, Anilao in Mabini, Sombrero Island in Tingloy, these areas more popularly known as Anilao. With its alluring shores and beaches, Batangas turns out to be a principal player in the tourism of the Philippines both locally and internationally. Batangas is also where Taal Volcano, the smallest volcano in the world resides. Although attached to the big Island of Luzon, Batangas boasts of flora and fauna that is distinctively theirs and theirs alone. Batangas is also a home to the “kabag” (Haplonycteris fischeri), one of the world’s smallest fruit bat. Although Batangas has these land flying mammals, marine wildlife remains to be the province’s crowning glory. In fact, in the second half of 2006, scientists from the United States discovered that the Sulu-Sulawesi Triangle has its center at the Isla Verde Passage, a part of the province. Batangas is an all-around destination for adventurous and enthusiastic travelers. You can even enjoy mountain climbing and volcano trekking, stroll around the beaches, bask in the sun, scuba dive as Batangas is rich in marine biodiversity, learn about rich culture and history, and more! Tagaytay is a famous summer and weekend getaway destination in the Philippines. Located in the province of Cavite, it sits on a ridge above Taal Volcano which overlooks a panoramic view of the Taal Lake with the Taal Volcano island in the middle. It has always been one of my favorite places in the country due to its colder weather and accessibility from Metro Manila. You can reach the city within 2 hours and enjoy a relaxing weekend or summer. The city also offers lots of things to do: from visiting organic farms, hiking the Taal Volcano and playing golf in the crater, visiting nearby islands and towns, amusement parks, museums, and historical places. It is even better if you are a foodie, as Tagaytay has wide selections of good and award-winning restaurants. And if you are a healthy eater, there are organic farms that serve healthy and tasty food options. You can also enjoy a relaxing spa in one of the world-renowned country resorts in Tagaytay. You won’t definitely run out of things to do and food to try in this place! The Philippines may be most well known for its tropical islands, but one of my favorite places in this spectacular country is the Banaue Rice Terraces in the northern province of Ifugao. These terraces are often referred to as the “8th Wonder of the World” and for a good reason. The terraces are said to have been built roughly 2,000 years ago, and from the looks of it, it must have taken a lot of time and effort. Once you take a look at the epic scenery and meet the most wonderful Ifugao people, the long drive you took to get there fades away as you breathe in the calm air of an ancient site. This is a hiker’s paradise as Banaue is actually a conglomeration of four rice terraces. Each terrace is named according to the “barangay” (village, district or ward) in which it is located. You can, therefore, spend the day hiking the different terraces of Batad, Bangaan, Hapao and View Point. Remember to take your swimsuit as there are both hot springs as well as a chance for a refreshing dip by the Tappiya Falls. Due to its remote location, this is a part of the Philippines that many tourists do not see. So make the effort to get there and you will be rewarded with incredible views of an impressive collaboration between man and nature. Balabac is one of the most beautiful places in the Philippines, and a proof that there’s more to this Asian country than listed in popular blogs and television features. Balabac is a municipality in the south of Palawan. To get here, you need to take a flight to Puerto Princesa, commute via bus or van to Rio Tuba and then take a morning boat to Balabac. There are a total of 30+ islands in this area, including the mainland Balabac where you can book accommodation and several others ideal for island hopping. One of the reasons I love Balabac are the people. We were welcomed and well taken care of during our few days’ stay. Also, the seafood here is cheap and fresh; you can buy shrimps and lobster for a few hundred pesos or ask your guides/boatmen if they can go fishing during island hopping. Finally, there are the beaches. The beaches in Balabac are blue, clear and definitely magazine worthy. The sand ranges from chalk white (Punta Sebaring) to pink (Camiaran Island). There are also islands where you can spot sea turtles or groups of starfishes. Lastly, there’s the premiere Onuk Island, where you can free dive to see sea turtles and giant clams. For us, Balabac represents the ideal that the Philippines has to offer. It’s breathtakingly beautiful, it’s pristine and untouched. When you think of the Philippines you most likely think of white sand, azure waters, and tropical islands. But the Philippines actually has more to offer, including the historical Spanish town and UNESCO World Heritage Site Vigan. Located on the west coast of the big island Luzon you can’t help but fall in love with adorable cobblestone streets, horse carriages, and gorgeous Spanish influenced architecture. You will pinch yourself for a moment because you can’t believe you’re actually in Asia. Vigan is incredibly picturesque and unique because most old and historical structures in the Philippines haven’t survived over the years and yet somehow Vigan is perfectly intact from their influences of Spanish colonization dating back to the 16th century. Don’t go to Vigan and miss out on trying their world-famous empanadas. You can easily find the outdoor markets which have one empanada stand after another. The empanadas are orange in color and sort of like a thin taco that has been deep fried with meat and veggie fillings. For the best experience, dip your empanada in the Ilocos vinegar sauce with onions and chili. Cagbalete Island is a tiny island off the coast of Mauban, in southern Luzon. It’s about a six-hour journey from Manila to Mauban, and once you get to Mauban you’ll need to take a short ferry ride over to the island. What makes Cagbalete charming is how unassuming it is. Most people don’t even know it’s there – it’s got a couple of locally-run resorts, a tiny “town” and the local village – that’s about it. Once you get there, however, you’ll be spoiled with endless stretches of white sand and crystal clear ocean. The local resorts, which are more than affordable, will pamper you with 3 meals a day of all kinds of Filipino treats. If you avoid Holy Week, there’s a good chance you’ll have the whole place to yourself too. If you’re in Manila and itching for some beach time, this might just be the place for you. Lake Taal is spectacular and truly unique. This stunning lake is not actually a lake but a volcanic crater which houses a delightful surprise – another volcanic crater. Like a Russian doll, the smaller crater sits within the larger crater and is a sight to behold. It is an adventure just getting to Taal Volcano, especially if you choose to take a DIY Tour. You will need to jump on a selection of buses to Tagaytay, then hire a tricycle, then negotiate a fare for a boat from the outer crater shore, followed by a 40-minute hike up the crater sides to be rewarded with this gorgeous vista. Along the way, you will catch the occasional whiff of sulphuric fumes belching from the underbelly of the hillside, and all around your eyes can feast on sublime views of densely forested peaks rising from the waters. The memories of reaching the stop will stay with me for a long time! The Mindanao island group is named after the largest island Mindanao and made up of several other smaller islands in Southern Philippines. To island hop around Mindanao, you’ll want to fly into Davao City, the largest city in the region. Cebu Pacific usually has the best-priced flights and they often have really cheap promotion fares. There are tons of tourist spots in Mindanao from scuba diving, beach resorts, outdoor adventures, surfing, and much more. The Philippines is chock full of wonderful destinations to visit, but (one of) my favorites is my home province of Surigao del Sur. Down south in eastern Mindanao, it doesn’t get as many tourists as the other top spots in the country, but it has a lot to offer for nature lovers. There’s one of the cleanest river in the Philippines, for example – the Enchanted River, which, true to its name, is said to be a home of spirits. There’s Britania Islands with turquoise waters and fine white sand, and numerous waterfalls including the spectacular Tinuy-an Falls. Surigao del Sur also has a lot of caves and some roadside springs like Libuacan Cold Spring that is unbelievably clear and clean. Because of its relative distance from the Philippine capital, it’s not on the usual list of places to visit by foreign tourists. Indeed, for an off the beaten path in the Philippines, Surigao del Sur is hard to beat. Located just south of Bohol, Camiguin Island is one of the Philippines’ most beautiful hidden gems. Upon first glance, the terrain is craggy and mountainous since it’s a pretty small island made almost entirely of volcanoes and their surrounding land. The most unique thing about visiting this island is that, instead of miles of white sand beaches and big resorts, Camiguin’s true splendor lies in is its waterfalls, hiking opportunities, and access to unspoiled beauty. I’ve visited Camiguin several times because my grandmother lives there, in a home located in the bustling town of Mambajao. Whenever I visit, I try not to spend too much time indoors. On the island, visitors can go swimming in cold springs, hot springs, and soda springs, where the water is naturally carbonated. There are several waterfalls, the most notable being Katibawasan Falls and Tuasan Falls. Along with a local guide, you can hike to the crater of one of the island’s many volcanoes, including Mount Hibok-Hibok. If the water is more your thing, there are many scuba diving opportunities, as well as day trips to small islands like Mantigue Island and sandbars like White Island nearby. If you’re looking for a more rugged, off the beaten path outdoor adventure, Camiguin is a stunning natural playground worth a stop on your Philippines itinerary. Known as the surfing capital of the Philippines, Siargao is one of those islands that remains in the middle of a hidden gem and a popular find. Not too elusive that it’s nearly impossible to get to, and not too popular that the authenticity is on the verge disappearance, Siargao is that perfect find. If anything, Siargao is one of the most authentic islands I’ve seen in the Philippines. Although the western world has graced its influences here such as the surfing culture, Aussie smoothie bowls, and modernized hotels, the tropical Filipino island culture isn’t lost at all. 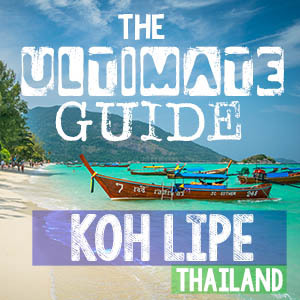 Exploring the island can be quite mesmerizing as you lose yourself within the labyrinth of coconut tree plantations and the breathtaking beaches that will take you a world away. Island hopping around Siargao is also an incredible way to pass the slow mornings and it’s best done with the local tours as they will arrange it complete with a fresh grilled lunch that I can assure you just might be one of the best you’ve ever had. Whether you’re a surfer or not, Siargao is one of the places you should absolutely consider as it’s perfect for anyone looking for a legitimate island getaway. Easily one of Philippines’ best, I suggest going now before it gets too known. Touted as the “beach island of Davao” – Samal Island is just a quick 10-minute boat ride from the hustle & bustle of the big city. Further down the coastline (about 45 minutes from Davao) there is the only 5-star luxury resort on the island called Pearl Farm Beach Resort, which has overwater bungalows offering 360-degree views of the pristine turquoise water. This nearly untouched area of the island will wow you with its gorgeous grandeur, unparalleled hospitality, sensational dining, perfect spa treatments, and give you that moment of being in a true paradise. One of the major attractions here is the giant clam sanctuary. You can take a tour out on the water to get to the clams and then you snorkel out to see them. The clams are protected and some of them are as big as 150 feet! No trip to the Philippines would be complete without stopping by Samal Island for a mix of luxury and adventure. The Visayas is the group of islands, some small some large, in the central Philippines. The largest of which are: Panay, Negros, Cebu, Bohol, Leyte, Samar, Siquijor, Biliran, and Guimaras. Cebu is a big hub to travel around the Visayas. When looking for flights to the Philippines the cheapest options would be to fly to Cebu or Manila. Sardine run in Moaboal, Philippines. Located on the west coast of Cebu, Moalboal is one of our favorite destinations in the Philippines. We stayed at a B&B facing the sea, where we enjoyed beautiful sunsets every evening. It is here where we witnessed the underwater phenomenon of the sardine run. Imagine swimming with hundreds of thousands of sardines in the open water, literally right in your backyard! A paradise for divers, Moalboal is within minutes to the world-class dives sites like Pescador Island and an airplane wreck. Even if you don’t dive, the house reef is excellent for snorkeling with giant schools of fish and turtles. Moalboal is the perfect home base for adventure seekers who are interested in canyoneering, chasing waterfalls, and the controversial swimming with whale sharks in Oslob. The beautiful waterfalls of Tumalog, Tanawan, and Kawasan are all in close proximity. You can also get your adrenaline fix by jumping into turquoise canyon waters of up to 50ft! Boracay has everything you could want from a small island, from spots of quiet solitude to watersports facilities. At just 7km long and half a kilometer wide, it is an ideal holiday spot for those who want to shun modern transport and explore the whole island on foot or by bicycle. White Beach, the main strip of dazzling white sand, is 4km long and is a hub of activity. Visitors can enjoy glass-bottom boat trips, kayaking, and scuba diving in the crystal clear waters off the island. As postcard-perfect as the island is in the day, it is enchanting and vibrant at night. Fire dancers twirl on the sand as the sun goes down and live music fills the air. Intrepid explorers can get to Boracay in an hour by airplane from Manila or Cebu. Those wanting something a little different can visit a bat cave; sit outside and watch the bats fly out to hunt at dusk. Don’t forget to check out Puka Beach on the northern tip of Boracay, which is often deserted and is exactly what one imagines a desert island to be. If you’re lucky with the tides you will spot locals collecting the ‘puka’ shells that they use to make the local jewelry that is sold on the island; buy a bracelet as the perfect memory of your trip. Guimaras Island is one of the smallest tourist destinations in The Philippines but it still offers a variety of attractions to the willing tourist. Guimaras’ claim to fame is for the sweetest mangoes in the world according to the Guinness World Records. Visit the National Mango Research and Development Centre which produces mangoes for both production and research purposes and try the only mangoes that are served at the White House and Buckingham Palace. An island hopping trip including Ave Maria Islet was one of my favorite activities in all of the Philippines. I got the chance to snorkel in some of the clearest waters where there was no need for a mask because you can easily spot the fish, coral, and starfish littered around the tiny island. The shore features fine, white sand and just enough space for maybe 20 people. Also located just off the island, is SEAFDEC, an intergovernmental body established as a regional treaty organization to promote fisheries development in Southeast Asia. Sounds boring but it was really interesting listening to the passionate staff talk about their current research projects and see what it’s like to work and live in such a unique environment. The Station is comprised of four islets and floating cages interconnected by floating footbridges. Located only eight kilometers off the northern coast of Cebu, the island of Malapascua is one of the most beautiful and laid-back destinations you can find in the Philippines. The island is world-famous for its fantastic diving spots, and there are many dive centers offering courses and day dives. It’s one of the few places in the world where you can encounter the great Thresher Sharks, which are present year-round. found at a 30-meter depth, and not too far from the coast. Dive centers ask you be a certified diver, and ideally an advanced diver, to join them and enjoy the adventure. The way to get to this little island, a short boat ride away from northwest Cebu, is already a stunning journey through the hilly countryside of North Cebu. From the ferry terminal in Hagnaya Port, you reach Bantayan within 1 hour by ferry which is just $2. The island itself is a truly untouched local experience off the beaten path in the Philippines. Most tourists head to the nearby and much popular Malapascua and that makes Bantayan the perfect island to get off the tourist trail. The best thing to do is to rent a scooter and explore the rugged coastline around the island. Drive all the way North to get a glimpse of the beautiful Kota Sa Madridejos or take a day trip to the tiny but stunning Hilantagaan Island. Stay on the Southwest side of the island where you will find a local village with some restaurants, supermarkets, and a couple nice homestays. This is also where you can find a typical picture-perfect Filipino white sand beach with crystal clear water. Bantayan is a truly local experience! Dauin is located about 12 kilometers south of Dumaguete on Negros Oriental. This small coastal town offers world class diving, which is the main reason why we visited. The Philippines’ most successful marine protected areas or marine reserves can be found along this stretch of coastline. Nearby Apo Island is one of the oldest marine sanctuaries in the Philippines Because of this the biodiversity is amazing. The Dauin coast is famous for its excellent muck diving, but also offers some fun wreck dives and drift dives. It’s a macro photographers heaven. Along the coast, you’ll find a great number of dive resorts in different price ranges. We opted to stay at Liquid Dumaguete Dive Resort, which we really enjoyed. Dauin itself isn’t much, but nearby Dumaguete can be easily reached. Dumaguete is a lively town that offers lots of restaurants and a number of bars and nightlife options. Bohol is famous for its crystal clear waters and abundant marine life and people flock here to take advantage of the endless stretches of white sand and the fabulous diving and snorkeling opportunities. Here you can go dolphin watching, swim with turtles and seek out the famous chocolate chip sea stars. However, there is more to Bohol than just the beach and ocean, and the countryside is beautiful to explore too. The Chocolate Hills are Bohol’s most famous landmark. Unfortunately, they are not actually made from chocolate but named because the grass on them turns brown in the dry season and looks like chocolate. However, with more than 1,000 hills stretching over 50, it is still quite an impressive site. Bohol is also famous as the home of tarsier. These cute little creatures with the big bug eyes were thought to be the inspiration behind Yoda, E.T and the Gremlins (before they turned bad) and are endemic to Bohol. With only around 700 tarsiers left on the island, you can hunt them down in a Tarsier Sanctuary. You should also take some time to explore Bohol by the river. You can take a lunchtime river cruise, go paddle boarding or for an amazing adventure, go firefly kayaking at night. With over 7,000 islands you are bound to find your own slice of paradise in the Philippines. Each beach seems to be more stunning than the next, but one of my favorite places has to be Apo Island. A marine reserve south of Negros Island, this small sliver of land is home to some famous Filipino Sea Turtles and is a great spot for diving. The water is extremely clear, so visibility of marine life was not an issue. The turtles are used to seeing people so it isn’t difficult to swim with them at a safe distance and observe them without swimming away. There are a few options to stay on the island or you can visit on a day trip if you are coming from Negros, Cebu or Siquijor. There are only a few beach bars and restaurants on the island, I’d recommend arranging a packed lunch if you are just coming for a day trip so you can spend as much time in the water as possible. There is no ATM on the island, so be sure you bring enough pesos if you are going to stay for longer than a day. If you’re staying on the island, sunrise or sunset climb up to the old lighthouse offers some wonderful views. This is the perfect place to appreciate marine wildlife and see the effects of sustainability helping a species. 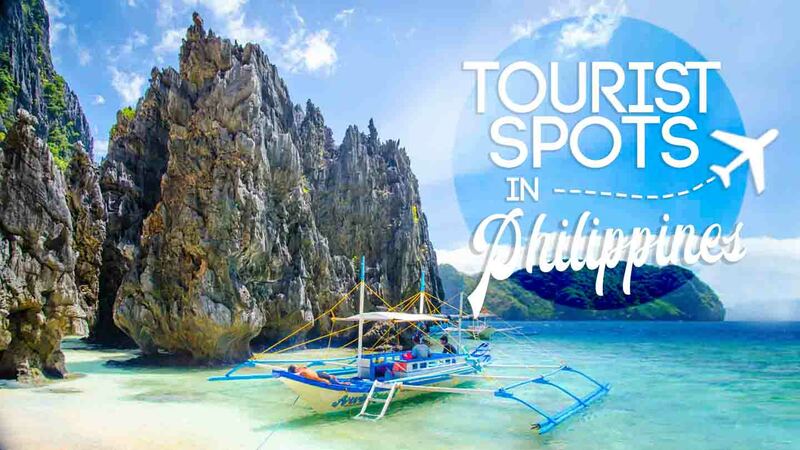 Now we’ve shown you some of the best tourists spots in the Philippines we’d love to hear from you. What’s your favorite island in the Philippines or what do you think is the best beach in the Philippines? Pin me to come back to when planning your trip to the Philippines. That’s a tough one…we will always go back to the Palawan but there are so many island in the Philippines we want to explore! This is such an awesome detailed guide to the Philippines! The beautiful places in Philippines are toward the top of my travel list and this is so helpful in breaking down the top spots to visit as it makes things easier. El Nido especially looks and sounds amazing. Would love to dive there someday! Thanks for sharing this! Glad we could help you pick out some of the best places in the Philippines. There are so many gorgeous islands in the Philippines to choose from it can be tough. El Nido is our favorite place too and great diving. Have you been to Vigan? That’s also a great place. It’s like a mini Spain. The place is surrounded with old buildings like those you find in Spain. You also have to try Empanada (local delicacy) it’s so good. Thanks for replying Hannah! No we personally haven’t been to Vigan yet but we’ve heard great things about it. We love Empanadas! There are many beautiful tourist spots in the Philippines. Definitely, El Nido is one of the best if not the best. If only they were extra careful of taking good care Boracay, they would have preserved its beauty. Good thing they are now finally taking action to restore how it’s like before. Batanes is also good if you’re into scenic landscapes. Hopefully, Boracay will have a come back in the upcoming years. That will be a good example to protect the other islands in the Philippines. We’ll have to check out Batanes too. This post makes me want to return. Much as I loved Lake Taal, I didn’t realise there were so many other things to do close by. It’s a shame there isn’t more time! I know we too didn’t realize we were so close to so many other amazing tourist spots in the Philippines. Great round up guys! Still so many places I’ve yet to see. 2018 is looking promising with more new places in mind! We could easily spend all of 2018 island hopping in the Philippines! I am soooo saving this for later. Thanks, guys! This is such an awesomely detailed guide to the Philippines! The Philippines are toward the top of my travel list and this is so helpful in breaking down the top spots to visit. Coron especially looks and sounds amazing. Would love to dive there. It’s super hard to decide where to go in the Philippines and which islands fit your travel style. The Philippines are amazing and deserve to be at the top of your travel list. Hope you get there in 2018! So jealous you spent 3 months in the Philippines! What was your favorite tourist spot in the Philippines or did you have a hidden gem? We only spent a month there but could have easily spent a year. The Palawan was our favorite place. Do you know the name of the island you stayed on? We hope to get back soon. ive been wondering where i should go when hubby goes for his little mountain trek to PNG in Oct… im now thinking the Philippines thanks to you! Ive been to Boracay but maybe ill check out Coron this time! You should def head to the Palawan it is WAY WAY WAY different then Boracay. Don’t expect any Starbucks on the beach here! The places you mention above are too beautiful. I am planning my honeymoon tour packages in Phillippines in upcoming month…. I sure visit these places you mention above. Glad we could inspire you with a few great Philippines honeymoon spots to consider. Let us know if you have any other questions. We honeymooned in Asia ourselves!